A driver should be placed in a matching cabinet of adequate size. To determine the correct size the Thiele and Small parameters are being used (especially the Equivalent Volume Of Compliance Vas, the Total Q Factor Qts, the Driver Free Air Resonance Fs). (e.g. Plasticine) attached to the diaphragm. Measurement Ia) and Ib) with Clio are shown on the right. Using Clio is particularly easy since all switches are hidden in the Switchbox and only one cable is necessary (e.g. for impedance measuring). After both impedance spectrums have been recorded, the results of simple devices to be analysed are shown in graphical format. Using Clio, the impedance spectrums - according to spectrum I) or II), as you prefer - are then analysed and all relevant data including voice coil capacitance etc. are shown. Important are : Qts, Vas and Fs (sometimes also called f0). The remaining parameters may also be helpful, when you are using software that requires additional data. For comparison we have also used the method with additional weight. 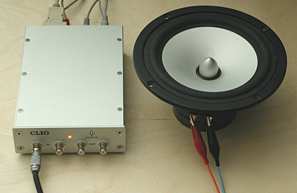 The findings are very similar and showed exact the same results in later loudspeaker calculations.